"Breve teoría del viaje y el desierto", awarded with the Premio Internacional de Cuentos "Manuel Llano”, 2010 , directly challenges the majority of the accepted conventions in our literature, regarding what constitutes the formal nature of short story writing. The six stories of Breve teoría del viaje y el desierto contemplate the full range of human experience. They take us on a journey around the world, from the arid landscapes of the Mediterranean coast to the work of the brilliant Serbian writer, Milorad Pavić. All of the characters are waiting for, searching for, or exploring the possibility of a revelation which never appears in their numbed here-and-now. And yet, paradoxically, they seem incapable of taking any kind of effective action, with the possible exception of Lena, who writes from the floating world of dreams. As Sufi mysticism tells us, the soul craves change, and immobility can feel like a slow death that can creep up anywhere: turning up on roads, in deserted parking lots or hotels packed with tourists (the desert of the modern world). However, fate or mere chance (an irrelevant incident, someone fainting on a nudist beach, a plane crash that never actually happened) can reveal in a flash the true face of a character’s isolation. 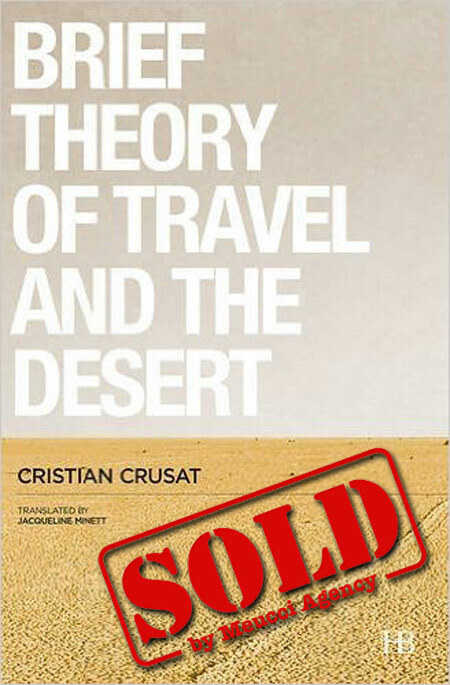 Thanks to an extraordinarily versatile prose, a nomadic style, which adapts to the different spiritual, physical or imaginary locations of each story and to the fragile individuality of their inhabitants, Crusat guides these buffeted characters through the abyss of fears, self-doubt and desires which make up the modern world.